A party on the plate — and in the dining room — at LV Mar. 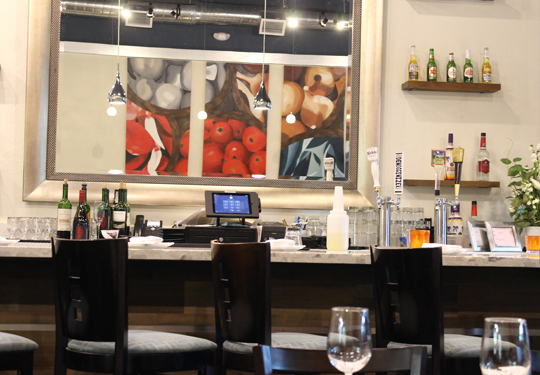 Most nights, LV Mar in downtown Redwood City, offers up a taste of modern pan-Latin cuisine in small and large plates. But once a month, Chef Manuel Martinez throws a veritable party — offering a prix fixe dinner themed to a different Latin cuisine, complete with a band, dancers and singers. A couple weeks ago, I was invited in as a guest of the restaurant to experience October’s showcase on the Caribbean. 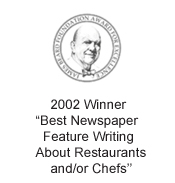 Martinez, who has cooked at Left Bank and One Market restaurants, also owns the more casual La Viga in Redwood City. LV Mar is his newer restaurant, which opened in November 2013. He’s been throwing these themed-dinners almost from the get-go. 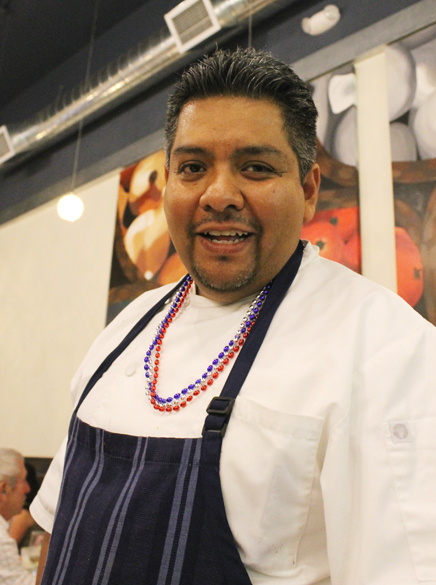 Chef Manuel Martinez adorned for the occasion. When you check in at the hostess stand, you’re welcomed with Mardi Gras-like beaded necklaces to wear. All the tables are strewn with colorful star confetti to put you even more in the mood. Be warned, though, that if you want to dine and have an intimate conversation with your dining companion, this is probably not the night to do so. The music gets loud and the dancers come through the narrow aisles to strut their stuff. But if you’re after a rousing good time to take your mind off a long day at work, this themed-dinner will definitely get your groove on. 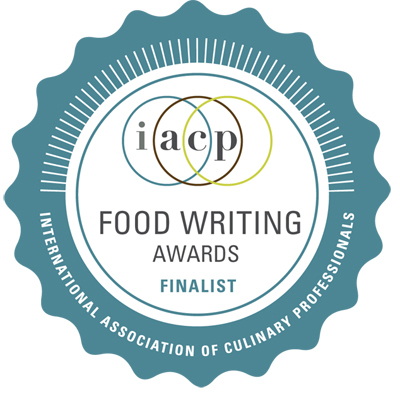 The prix fixe is $45. Or add another $25 for beverage pairings, including a Pina Colada, Mojito, Ritual Sauvignon Blanc, Verramonte Cabernet Sauvignon, and a Cafe Cubano to end. It’s a bargain for the amount of food you get. There are two choices for the first course, second course and entree. If you’re dining with a companion as I was, have each person order something different so you’ll get to try everything offered that night. 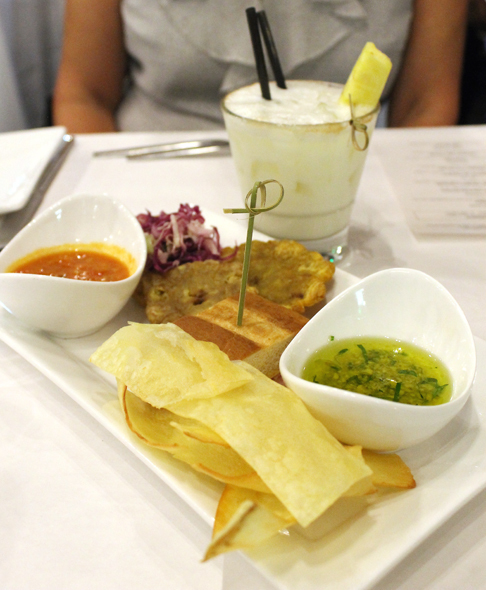 The evening began with a shared appetizer, “Picadera,” a platter with a small Cuban sandwich, tostones, pupusas, and yuca chips, along with two sauces: spicy pepper and garlic-herb. The yuca chips were light and crisp, and the Cuban sandwich a fun idea. I only wish the tostones and pupusas were hot when served, as they tasted as if they had been fried hours ago. A sampler of appetizers to share. Next up, one of my favorite dishes of the evening: pigeon pea soup with chicken and pork. It doesn’t sound like much and it looks sort of minestrone-like on arrival. 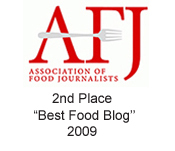 But the depth of flavor was amazing. The creamy beans added a hearty richness, along with chunks of tender meat. This is the soup you want to curl up with on a winter night. 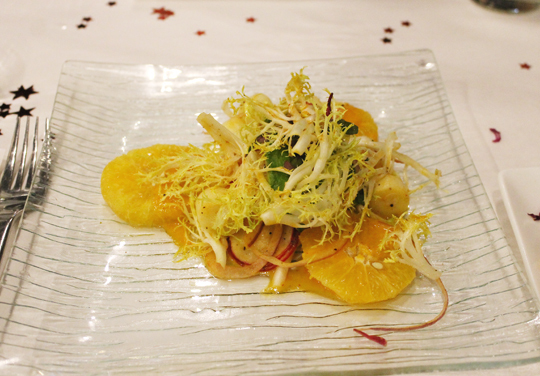 The hearts of palm salad was a nice way to perk up the palate with slices of avocado and orange in a light honey-lime dressing. 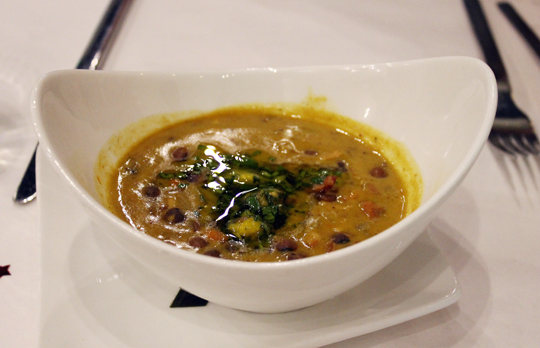 Who knew pigeon pea soup could be so satisfying? “Motongo de Camaron” brought a mound of mashed green plaintain — total comfort food — strewn with shrimp in a garlic cream sauce. 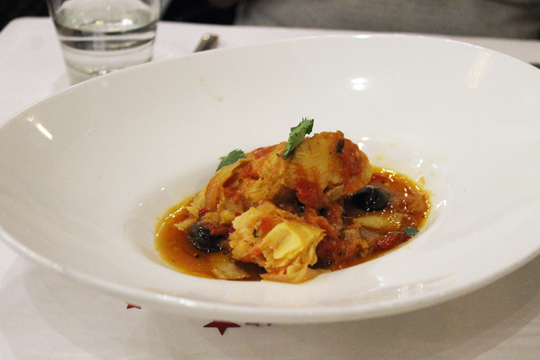 “Bacalao con Viandas” was a stew of salted cod, tomatoes, sweet potatoes and olives. It had a Mediterranean flair to it. I only wish the salted cod was a little plumper, as the pieces of fish tasted a smidge dry. Salted cod with root vegetables. 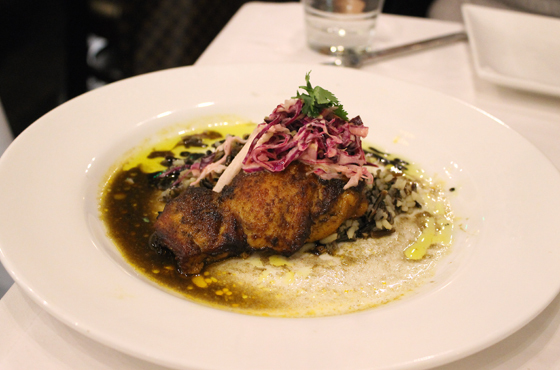 This version of “Jamaican Jerk Chicken” won’t set your mouth afire. Instead, its tender meat infused with cinnamon and other spices is more on the mild side. 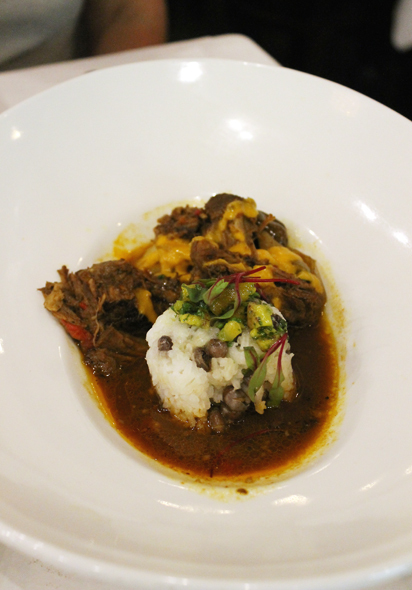 The braised beef in the “Ropa Vieja” was fork-tender in its mix of capers, olives, potatoes, and red bell peppers. Mix in the accompanying white rice to enjoy all the beefy sauce. The dessert is a shared plate and more than plenty after all the food that preceded it. Flan de Coco was eggy and custardy with rum syrup poured over the top. 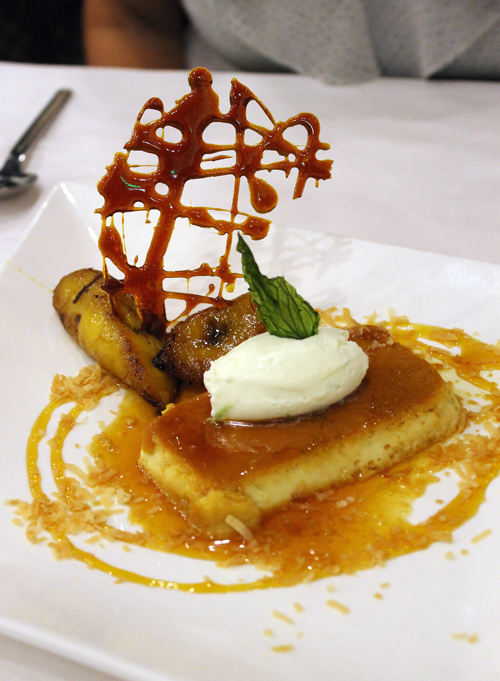 Sweet plaintains that were like a starchier cousin to caramelized bananas finished the dish. With a lot of food and a lot of song, LV Mar definitely feeds guests on multiple levels. 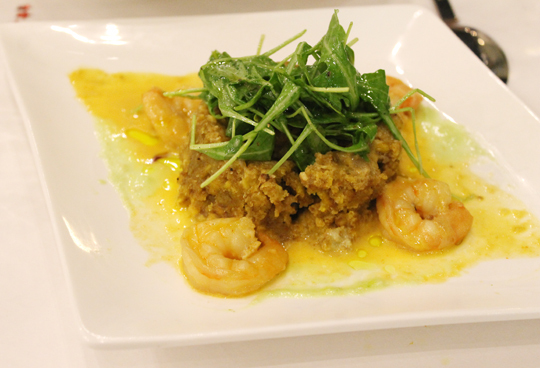 Oooh, haven’t had shrimp mofongo in so long!